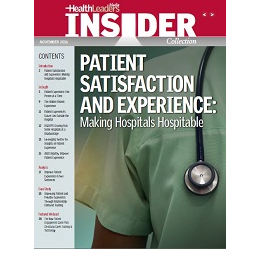 The rise of value-based care, consumerization, increasing deductibles, and a growing number of social media platforms where dissatisfied patients can publicly vent their frustrations are all reasons why improving patient experience has become indispensable for hospitals and health systems. But how best to implement an improved experience is a question with many different answers. Pleasing patients isn't an easy task. While most industries serve consumers eager to enjoy the product offered, most patients would rather be anywhere but the hospital. Some hospitals have taken inspiration from this, creating non-hospital-like care settings, but that's not always possible. Improving the experience of a consumer who might be having the worst day of his or her life may be an uphill battle, but, as we explore in six original articles, an analysis, a case study, and a HealthLeaders Media webcast, it's a battle that can be won if fought strategically. The difference between patient experience and patient satisfaction. Christiana Care's multipronged approach toward interpreting and understanding patient experience beyond HCAHPS scores. How HCAHPS scoring puts some hospitals at a disadvantage. Why empathy might be the secret ingredient to improve patient experience.